Fall appears to have dwindled much before I could brace the splashing golden-yellow to dark maroon hues of withering leaves and an unwelcome winter has already set foot in. As if it was not grim enough, the last few days have been no better than dull and depressing thanks to the dark amalgam of gloomy overcast clouds, icy cold winds and the diminishing daylight. Yet, I can smell the festivities in the air. Thanksgiving is only a week away and just about every TV show is grooving to the tunes of cooking thanksgiving dinner with nothing short of a twist. Notwithstanding a compelling melancholy outside the door, I set out to warm up this particularly listless end of autumn day in the spirit of Thanksgiving. And what added fuel to my cooking fire is this Butternut squash soup recipe from Parents magazine Nov 2010 edition that came as part of their food solutions for simple suppers. As I had all the time and was in the mood for experimentation, I conjured up the ingredients while I puttered in the kitchen. I didn’t have Butternut squash, so I decided to make-do with what I had at hand, an Acorn Squash instead. Besides, we seldom think of Acorn squash from the soup angle, so imagining that an Indian spin wouldn’t hurt the recipe, I replaced butter with Ghee, cilantro with dried mint leaves and introduced turmeric in the hopes of capturing the beautiful fall color in a bowl. Granny smith apple adds some tart to the otherwise faintly sweet Acorn squash and white or Vidalia onion interweaves itself with the delicate squash and apple flavors sans the pungency. 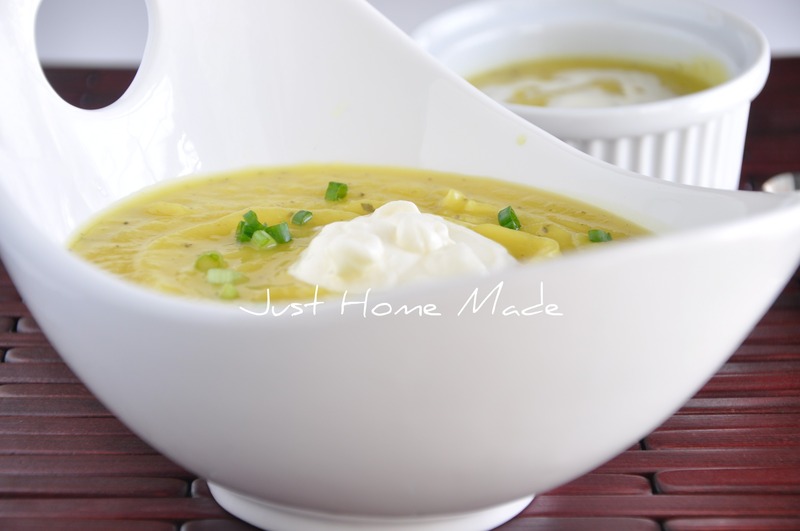 What you get is a mildly aromatic scrumptious bowl of soup fit to brighten up a dreary day. And I used it to count for the veggie servings in my toddler’s diet as well today. Heat ghee in a medium sized pot over medium-high heat. When the ghee is just hot enough, add the chopped onions, dried mint, garlic powder and turmeric in that order and sauté until onions turn translucent. Add in the diced acorn squash and granny smith apple and sauté for a bit. Sprinkle in the salt and pepper and cook until the veggies turn soft. Add just enough water to cover the veggies, about a cup or so and cover and cook until tender. Allow to cool once cooked. In a blender puree until smooth and return to the pot. Warm it up and adjust with more salt and black pepper if required. Serve warm dressed with heavy cream either whipped or as is and garnished with chopped spring onion greens. Just in case you need more twist to the sweetness, squeeze in some lemon juice, but before adding cream. CHURMURI CHURMURI WE WANT CHURMURI!!!!! Oh you got my mouth watering now – I can’t wait to make Churmuri myself! 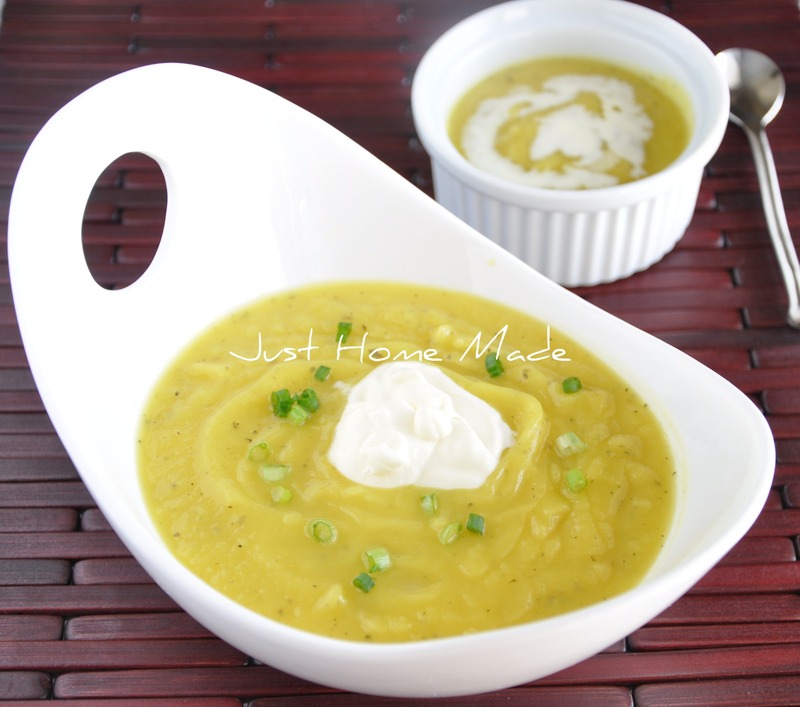 What a great improvisation on acorn squash soup! This is beautiful and I’m sure the taste was absolutely delicious! 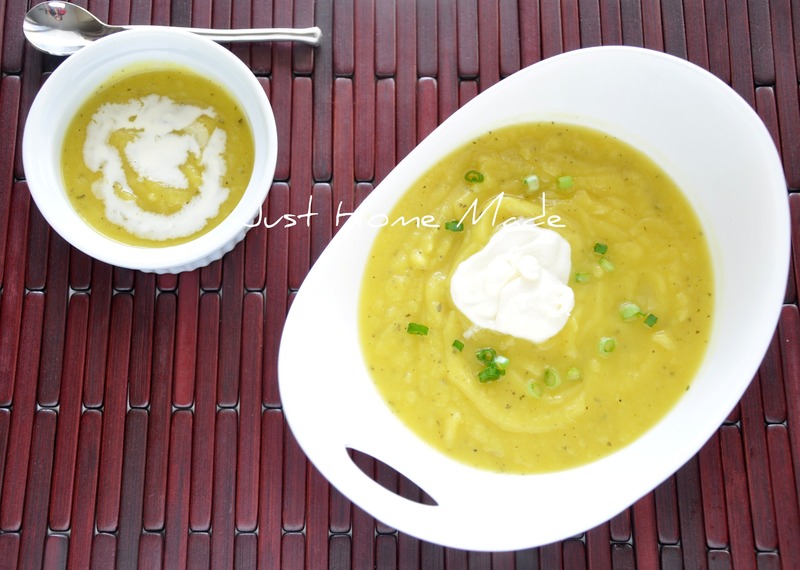 I love soup…especially in the dreary days of winter. This one looks great! Vidalia onion is perfect in this recipe for a sweet hint. The presentation of this soup is superb, well done on the photo’s!